I set out to tell a story of men who served in WWI in the D-Day invasion forces who were not direct combatants. Liberation Road is about two men, black and white, both desperate to fight: one prevented by his government, the other by his faith. The novel centers around the Red Ball Express, the African-American truckers who moved the materiel and men from the Norman beaches to the fast advancing front lines. The book also features a Jewish chaplain, who has come back to France to serve his God, as well as find his missing son. In a rental car, I drove the Red Ball route, south then east from Omaha Beach, a circuit of 325 miles nonstop, at 35 mph, rested 8 hours, then did it again. 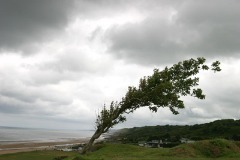 The invasion site, the view from a German pillbox, on a windy day. 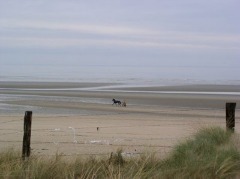 Omaha Beach, a peaceful image on a historical site. 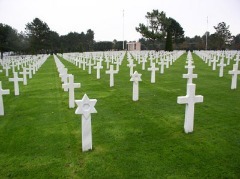 One of the most powerful places any American can stand, the U.S. cemetery near Omaha Beach. I was touched to see so many Stars of David among the stones.